It seems a bit shocking that people are searching on the internet for a “cat shock collar”. It sounds gruesome. At first I had visions of some medieval training aid, which I would be strongly against, of course. However, we have to give all ideas and opinions a fair airing and discussion. First, though what are cat shock collars? Well, they don’t actually exist but there are similar devices. There are dog shock collars that give a static electric shock on remote control command. They are used to train the dog. The classic is to stop the dog barking. The intensity of the shock can be set by the person. Dog Shock Collar – Cat Shock Collar? These devices are also used to keep dogs within a certain area. The dog wears a collar and a cable is placed around the perimeter of the area concerned, When the dog approaches the cable the collar gives a mild electric shock. If the dog advances further the shock intensifies deterring the dog to go over the perimeter. That, as I understand is the basic idea. The problem with cats is this. Although you can buy perimeter or boundary deterrents as described for cats there is no such device as a “cat shock collar” as far as I am aware. 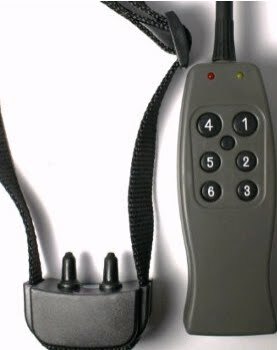 There are two important issues to consider (a) a dog shock collar should not be considered for use by a cat because the intensity of the shock is designed for a dog and (b) cats cannot be trained in the same way as dogs, or dogs are more responsive to training using these devices. To try and train a cat this way may well bring about unwanted and unpredictable behaviour. It is fundamental wrong I feel. In fact, I disagree with their use on dogs as well. There is a third concern. How intense is the shock? I think we should try it out on ourselves first. I have read comments on the internet of strong currents delivering a hard shock when devices that are not controllable are used. This seems madness to me. There must be a more humane and positive way of training a dog. Discount products of poor quality are more likely to harm the dog and be bought by people who are not committed to training the harder but more humane and decent way. The only time I have seen something similar for cats is the use of a device that contains a cat within an invisible boundary. A thin cable is placed around the edge of the cat caretaker’s garden and plugged into the mains electricity. A transformer reduces the current which can be controlled to find an intensity that deters the cat from crossing over the cable. I have seen this system installed and it did not work satisfactorily for an unknown reason. I have never heard of a cat shock collar being used to specifically train a cat (other than stop at a boundary). I would be strongly against it. That said in other comments one or two people have said that it works. If we are to assess shock collars we can only do it with any scientific accuracy in respect of studies with dogs. In one study it was found that inappropriate or inaccurate use of the collar, by the person remotely controlling it, caused high stress levels in dogs. This is because the dog could not understand why he was being shocked. The shock was not associated with specific behaviour (Schalke et al. study). In a perimeter control study, nonthreatening people near the perimeter were attacked by dogs who became aggressive. It seems the dogs associated the shock with the person nearby (Polsky study). It also seems to me that the intensity of these shocks is too high. They seem to be hurting the dog. It smacks of crude human behaviour not poor dog behaviour. It seems that the conclusions that can be drawn are these. Shock collars, be they dog or cat shock collars, are commercially manufactured products. There is a profit element. There are no controls or standards as far as I am aware that ensure that they are suitable for use; fit for purpose. Cats and dogs have almost no rights, we know. Studies (as mentioned) throw up severe doubts about their efficacy and possible unforeseen outcomes. These grave doubts apply to dogs. On that basis, it would be foolhardy, indeed reckless and possibly cruel to use them on cats in an effort to train them. The Amazon product is for illustrative purposes. Your comments and thoughts would be welcome and I don’t mind being criticised! my method works the best of all cat trainers ever, the good old fashioned “squirt bottle”. After a few squirts you dont even have to squirt them any more, just say “no” and shake the bottle. Of course you have to say their name so they know who your talking to. we are careful not to squirt the face of course. It works great for us and Im sure itll work great for everybody else unless your cat likes it, which I doubt. When the people who invented the cruel shock collars or those who use them were children and didn’t know how to behave I wonder how they would have felt being shocked to teach them right from wrong. In my opinion it’s no different children or animals,both merely need kindness not punishment to keep them right. I have nothing but utter contempt for anyone who resorts to using pain or fear to train any animal, and shock collars seem to me a particularly nasty, sly and cowardly way to do it because of course the animal doesn’t associate the pain with the owner because it’s done by remore control or a pre-setting. In an ideal world these things wouldn’t have been invented or if they were would have been quickly outlawed but it seems to me that cruelty is rife and the thought of people casually accepting using something like makes me so sad and depressed and despairing, there’s nothing humane about humans. If I saw anyone using one on a cat or dog I would have to physically assault them or I couldn’t live with myself afterwards. Great comments – thank you. I think the major point is that training by applying a shock is training by applying pain or at least discomfort. That is a form of deterrent by punishment or negative reinforcement. There is a better way as Anna says. The shock collar is sold as an easy way to train a dog or a cat. One again it’s commerce, financial profit getting in the way of treating companion animals properly and decently. Business doesn’t really care about these finer points. There is only one word to describe cat shock collars, and that word is ‘cruel’. It’s not arguable they are cruel and should be illegal. I know that in some states of Australia dog shock collars are illegal, and so cat shock collars should be too. Denying cats the right to speak and express themselves as they naturally deserve to is sick and I honestly find it completely disturbing. Oh, yea, hot subject matter, here’s my comment. 1. You can go ahead and waste you $44 or so hard earned money just to through it away. Doesn’t matter if it was a shock collar or a shock deterrent device intended for dogs or cats. They do not work,especially if made in China(LOL). I’ve heard stories how instead of being deterred, the dogs would come and leak the thing. 2. Imagine it did work and you were hurting your pet trying to keep him (her) within the range, hoping this be better than, say, home confinement or being run over in the street. OK. Remember ever seeing the Russian bears dancing to a Kalinka song? They kept them on hot bricks prior to the performance. So when those poor animals heard the music they assumed the heat was coming back on. Guess what the bears often did after the performance? Correct: attacked and often killed their torturers. 3. The most important here is to learn how to train your pet properly, scientifically correct. On this I definitely agree with Michael: the cats are learning differently from the dogs, or from the bears or the rabbits. The famous Austrian zoologist Konrad Lorenz taught that every behavior of an animal has a proximal cause and the ultimate, ie evolutionary one. 4. For cat fanciers exclusively I can recommend to look into the work of a cat circus legend Yuri Kuklachev, there’s tons of information on the web. Feb 09, 2011 This is awful! Whats wrong with Amazon for stocking such an item? Surely the RSPCA can demand they withdraw it? Surely after all they are encouraging and inciting animal cruelty? I can’t understand people an animal is trained with love and understanding not something like this! It gives all the cruel sickos out there another tool for their depravity! I think that anyone even considering the use of shock collars or shock fences is unfit to have any animal in their power. I think it’s disgraceful that someone thought up these cruel ideas to make money out of people too inadequate to understand their pets or to treat them properly. There is no such thing as a bad cat or dog but there are many bad ‘owners’ and I would like to give anyone who uses any barbaric method on their pet a good dose of their own medicine. Yes I think I shall invent shock collars for the many cruel and ignorant ‘owners’ and make myself a fortune. Dog owners can easily install either a wireless or a in-ground pet fence around their own yard to always keep their dogs safe within their own yard. I agree that cat collar seems ridiculous, though i don’t agree about that dog shock collars are bad. The main reason that i will use a electric dog collar is to avoid accident, as i walk the dog every day with my bike. I even wrote a guidefor the people in doubt. We can write a book about DO or DO not use such devices on our pets. However i prefer an alive and healthy dog versus a dead one, and the difference can be the way my dog reacts to instant command when he is far away from me.